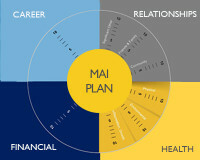 MAI Plan™ is designed to help you thrive in all areas of your life. It’s a values-based planning tool to bring focus and clarity to all four domains: Career, Relationships, Financial and Health. (MAI Positive Core™ is a pre-requisite). We thrive when we love what we do every day, enjoy high quality relationships, are secure in our finances, have vibrant physical health and take pride in what we contribute to our families, friends and communities. The true sweet spot is when all these hum along together in a symphony of interaction. While two thirds of us are doing well in at least one of these areas, only a fraction of us are doing well in all.